Flynn pleaded guilty last December to lying to the FBI and agreed to cooperate in the federal Russia investigation. A federal judge has set a sentencing date of Dec. 18 for President Donald Trump's former national security adviser, Michael Flynn. Flynn, who served in the administration as national security adviser for just three weeks before resigning Feb. 13, will appear in a Washington, D.C. courtroom at 11 a.m.
Flynn pleaded guilty last December to lying to the FBI about his communications with Russian officials and agreed to cooperate in the special counsel's investigation. According to court filings, Flynn made the false statements to the FBI two days after he was sworn in as national security adviser in January 2017. The maximum sentence for the crime Flynn pleaded guilty to is five years in prison. 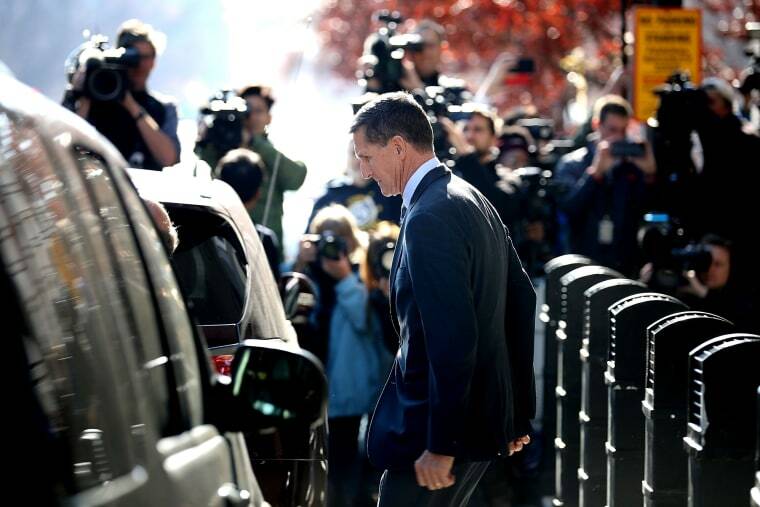 However, senior federal prosecutors not involved in the case told NBC News at the time of the plea deal that it is unlikely Flynn will ever spend a day in jail. In a joint filing Monday, special counsel Robert Mueller's team and Flynn's attorneys had asked the judge to set sentencing for Nov. 28, or any of the following seven business days after that date. Court records outline how the retired lieutenant general contacted Russian officials at the urging of two top Trump transition aides. Flynn falsely claimed that he didn't ask Sergey Kislyak, then the Russian ambassador the U.S., on December 22, 2017 to "delay a vote on or defeat" a United Nations Security Council resolution. He then falsely denied that Kislyak had described Russia's response to the request. Before that call, a "very senior member" of the transition team directed Flynn to contact foreign officials, including those from Russia, to learn where they stood and influence the vote, according to the statement of offense. Flynn has been at the center of the federal government's Russia investigation almost from the start. It was the FBI's investigation into Flynn that Trump asked then-FBI Director James Comey to end, according to a contemporaneous memo Comey wrote. Comey, whom Trump fired in May 2017, later testified to that assertion before Congress. The tweet suggested for the first time that Trump knew Flynn had lied to the FBI at the time Flynn was fired.